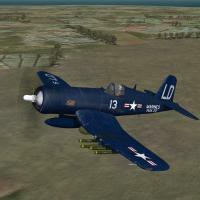 This package contains a modded version of the TMF/MM F4U-5 (built from the radar equipped nightfighter version, the -5NL), with various components removed. Almost all data ini edits (removals and such) were performed by CrazyhorseB34. Minor adjustments by me. 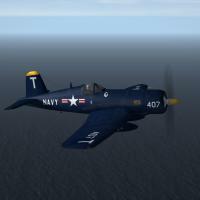 This pak represents F4U-5 Corsair fighter-bombers in the early and mid 1950s. Skins are in jpg format. Most markings are decals and Decal Randomization is TRUE. Weapons are not included; you should have them already. However, the pilot and engine sounds are. Standard Animations Keystrokes  are used for the canopy (Shift/0) and wing fold (shift/9). As always, fairly easy to follow, highly detailed install instructions are included. So, please read them before installing. Also, give the "Notes" section a read too. Good Hunting, and Happy Landings!